Irritable Bowel Syndrome is a disorder of the colon, characterized by irregular bowel patterns. The exact cause of IBS is unknown, but the major symptoms include abdominal pain, bloating accompanied with bouts of diarrhea and/or constipation. These symptoms tend to come and go. Managing your diet well and modifying your lifestyle is the best way to control IBS. Fiber is the buzz word for those affected with IBS, but it can be confusing at times. The fiber intake needs to be adjusted according to personal symptoms. The best is to use a diary with clear notifications of symptoms that triggered due to intake of a particular food. In general Insoluble Fiber helps to relieve diarrhea while Soluble Fiber helps to relieve constipation. But remember to not go overboard on fiber. Limit the intake of fruits to 2 to 3 per day and veggies to 3 to 4 servings per day. Try and increase your daily fiber intake gradually, because any sudden increase may make the symptoms worse. Rely on whole grains like oats, barley, quinoa; fruits like apple, banana, papaya, citrus fruits, muskmelon and prunes, veggies like carrot, cucumber, potatoes, sweet potato, baby spinach, kale, mint etc. and seeds like flax seeds, sunflower seeds and chia seeds. 1. Avoid processed foods like maida, semolina and rye. 2. Keep a check on the amount of wheat intake. It may not suit most people. 3. Cut down on fat intake. Avoid the deep fried goodies. 4. Keep a check on the consumption of dairy products. Milk may suit at times and may not sometimes. Avoid the full fat milk and opt for low fat milk instead. Curds are a better option amongst dairy products. You can try almond milk instead. Also restrict the use of butter, mayonnaise and cheese. 5. Avoid biscuits, cakes, sweets, confectionaries, mithais, pastries etc. 6. Drink plenty of fluids. If suffering from diarrhea, the lost water needs to be replenished and if suffering from constipation, water will help to bind stools and help in its elimination. 7. Avoid fruit juices as they are devoid of fiber and are high doses of fructose. 8. Limiting honey might also be helpful as it is high in fructose too. 9. Avoid sugar substitute or artificial sweeteners as they contain some amounts of sorbitol which can cause bloating and diarrhea. 10. Prefer to avoid tea, coffee, aerated drinks, alcohol, MSG, vinegar, chocolate, chocolate powder and chewing gum. 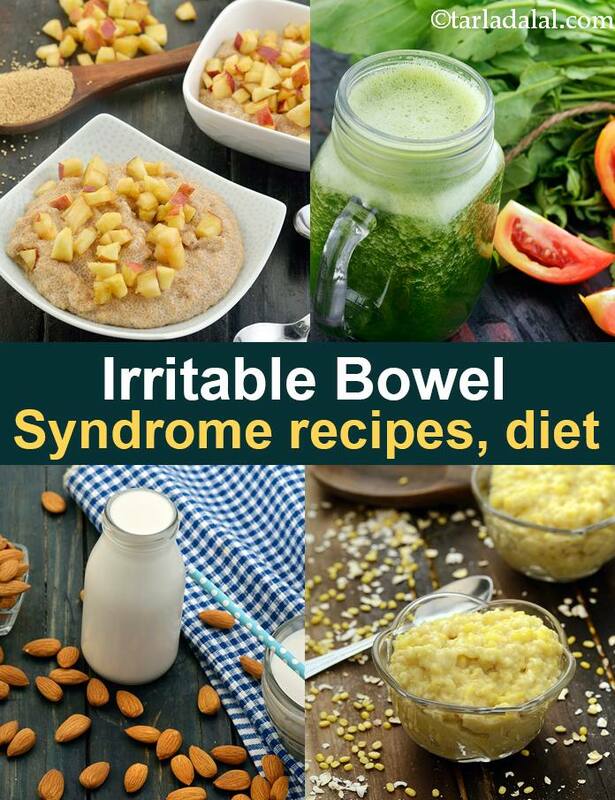 Here are some absolutely reliable recipes for IBS.